If your family is anything like mine, then you were incredibly busy during the week leading up to Thanksgiving. So while we managed to do a couple of crafts, the rest of our home preschool shenanigans went out the window. 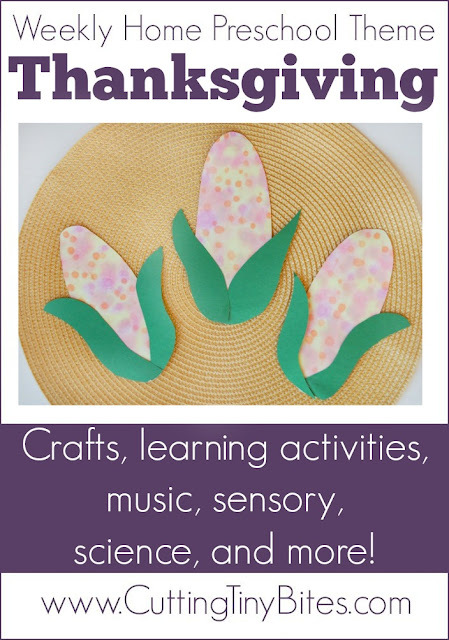 Instead of featuring what we did for Thanksgiving (which wasn't much), I'm giving you ideas of what you can do (and what we would have done had I had it all together) for your own Thanksgiving Theme Preschool Week. Have you ever played with Wikki Stix? They're sort of like lengths of waxy string that can be shaped and will hold their form. 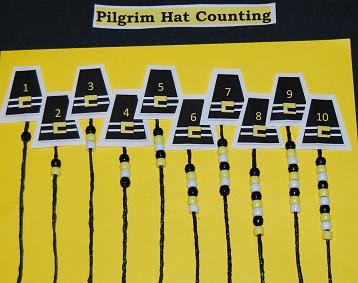 This math activity was developed by the fine people at Wikki Stix, and has your children counting pilgrim hats using pony beads. Let your kids help prepare Thanksgiving, and get in a little science while you're at it! 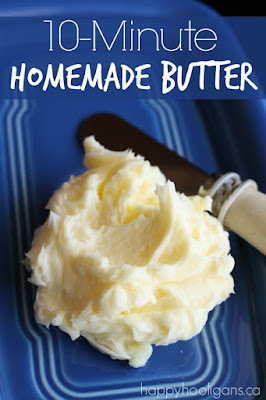 Kids will love making their own butter! Happy Hooligans shows you how in this tutorial. The girls both enjoyed making these Native American Pattern Headbands. They worked on colors, shapes, patterning, gluing, and fine motor skills. Then they had fun playing pretend with them. It was a winner! 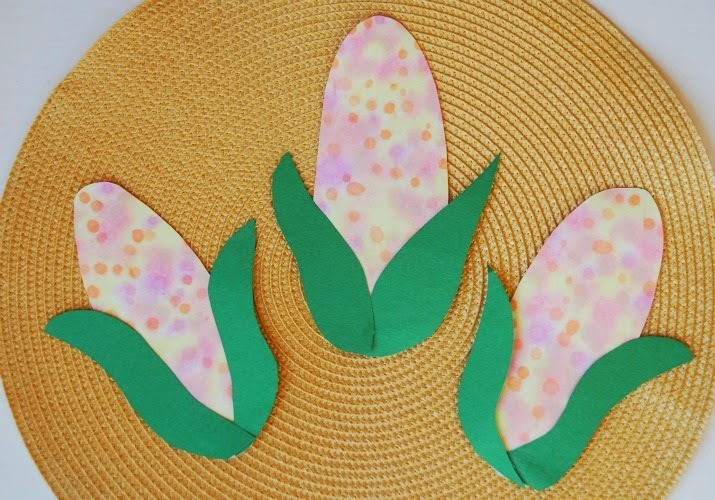 Our Eye Dropper Indian Corn was another fantastic craft to develop fine motor skills. My girls have loved crafting with eye droppers ever since I introduced them, several weeks ago. Still Playing School shows off this beautiful Thanksgiving Writing Tray. How inviting! I'd like to play with it myself. 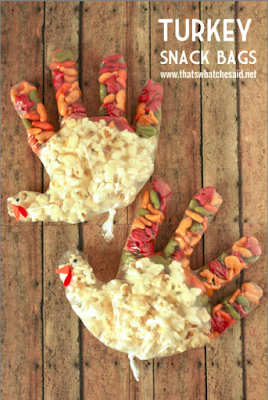 These Turkey Thanksgiving Snack Bags from That's What Che Said are like a twist on the classic hand print turkey craft, and I LOVE them! They're adorable, plus you could fill them with whatever you wanted (so long as the fingers were one color and the body were another). I love a cute snack that's not loaded with sugar! Need to get your kids moving? 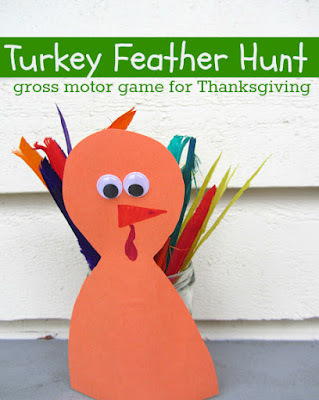 This "Naked Turkey" game from No Time for Flashcards sounds like so much fun! My kids LOVE hiding games, as do most toddlers and preschoolers. 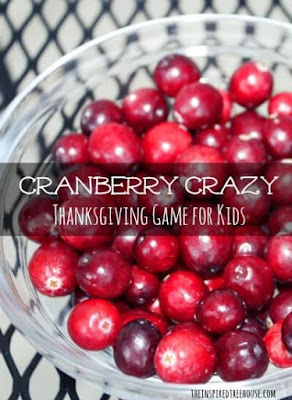 Kids who are a little bit older (older preschoolers through early elementary aged) might get a kick out of playing Cranberry Crazy, from the Inspired Treehouse. You kids will do all kinds of gross motor challenges while balancing a spoon full of cranberries. Sounds tricky! 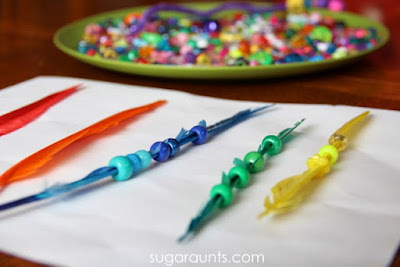 We did this activity from Sugar Aunts (but didn't get pictures), and my girls loved it! 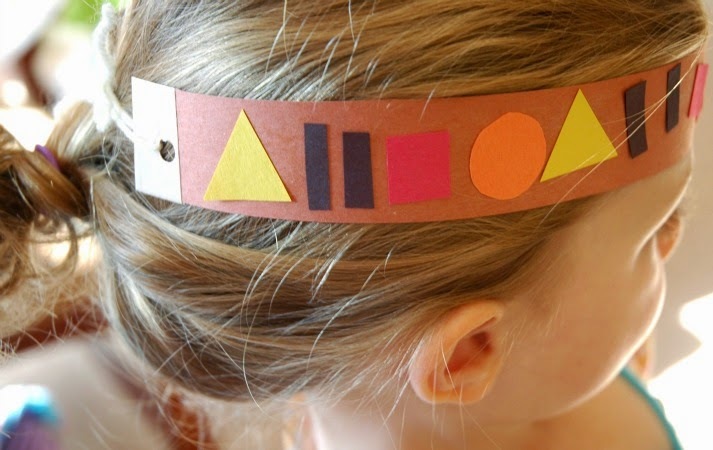 Both the color sorting and the fine motor practice are perfect for preschoolers! This is so simple to set up, you can grab your materials and go. 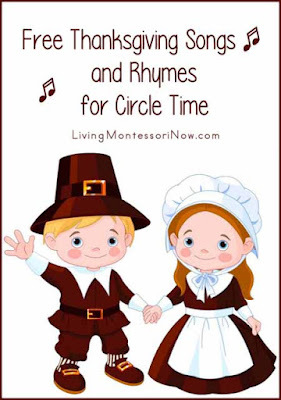 Living Montessori Now has a great collection of Thanksgiving Songs and Rhymes for Circle Time. Even if you don't DO circle time in your home preschool, chances are your kids will love learning these songs anyway. 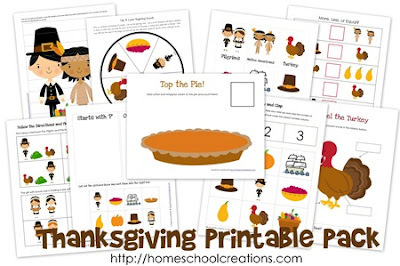 Jolanthe from Homeschool Creations made these awesome Thanksgiving printables that your kiddos will love. If my printer weren't broken, we definitely would have used these this week! 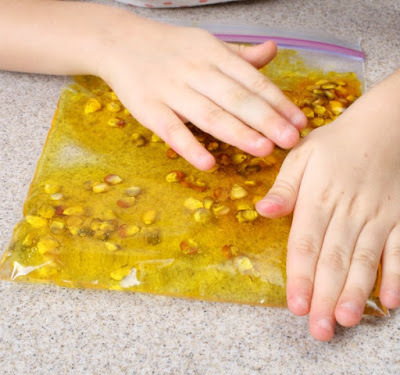 How awesome does this Indian Corn Squish Bag from Fantastic Fun and Learning look? Some kids don't like to get messy, but should still be able to enjoy some sensory experiences. These squish bags are a great option. 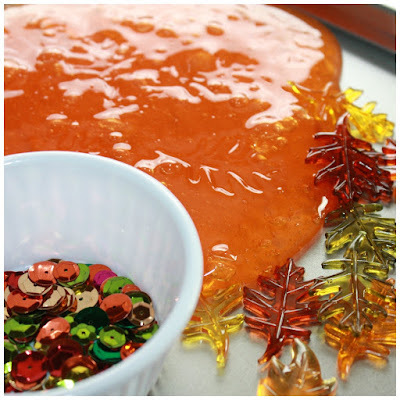 If your kids DO like to get messy, this Fall Slime from Little Bins for Little Hands looks nice and slimy! 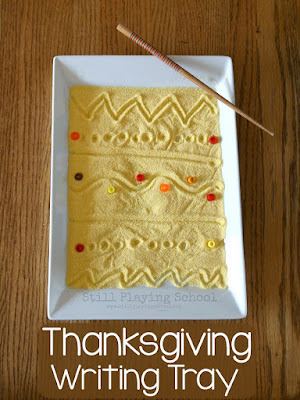 To see more fun Thanksgiving ideas, be sure to follow Cutting Tiny Bites on Pinterest, or just check out the Thanksgiving themed board below. 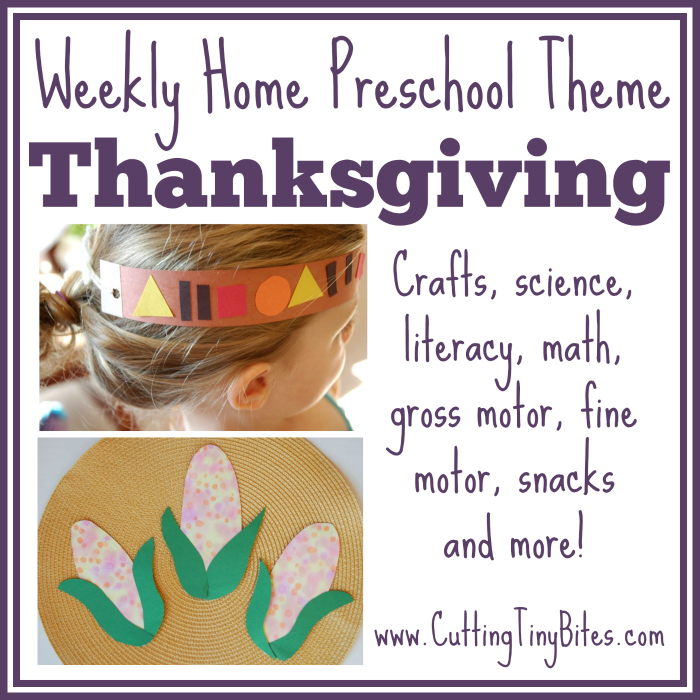 Thanksgiving Theme- Weekly Home Preschool. Crafts, learning activities, fine motor, gross motor, sensory activities, music, science, and more! Easy activities for one week of home pre-k.